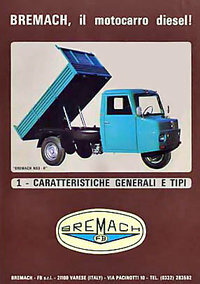 In 1956 Fratelli Brermna was established as a major machine shop for the growing manufacturing sector in post war Italy. There was great economic development founded on the switch from military to civilian manufacturing which encouraged development of new products aimed at the growing civilian market and requiring the support of a new wave of high quality designers, engineers and machinery. At the same time a significant manufacturer of military equipment Aeronautics Macchi founded in 1913, that has built over 7.000 aircraft, developed a new 3-wheel compact, reliable delivery vehicle for light weight freight carriage. Toward the end of the 1960’s Fratelli Brenna decided to acquire the production rights for the small 3-wheeled delivery vehicle developed by “Aeronautics Macchi” now called the AERMACCHI and using their own expertise to improve it. Taking a part of each name BREMACH was born. 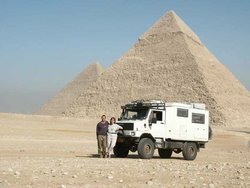 In the 70s, BREMACH concentrated on the light freight segment of the market and began to design, test and then manufacture a 4-wheel vehicle that has been used worldwide. Since September 1988 the BREMACH vehicles have been manufactured by Bremach-Fb S.r.l. in plant located in Varese, Italy. In the late 1990’s BREMACH became pat of the PRO.DE group which has a long and successful history in automotive design and engineering with DARMAK brand. In March 2006 the BREMACH vehicle production was relocated to Castenedolo, Italy from Varese, Italy. In November 2009 PRO.DE group reached agreement with American Custom Golf Carts, Inc. (aka ACG, Inc.) from Chino, California to research marketing potential for BREMACH vehicles in USA. ACG, Inc. developed two prototypes of vehicles suitable for the North American market, one powered by the GM V8 engine and another as a pure Electric Vehicle (EV) powered by electric motors and with energy stored in Lithium batteries. Both prototypes received great attention at trade shows and generated print and television as well as web exposure. Thus a decision has been made to actively expand the marketing of BREMACH vehicles to USA. In 2010 two variations of the BREMACH logos as well as the BREMACH name itself were registered as Trademarks with United States Patent and Trademark Office. Bremach Industrie S.r.l. has been incorporated under Italian law in April 2010 by Mr. Giacarlo Montini. In November 2010 Bremach Industrie S.r.l. has acquired the vehicle production rights for BREMACH vehicles from PRO.DE. In October 2011 BREMACH, Inc. has been incorporated by Mr. Miro Kefurt in Nevada, USA.